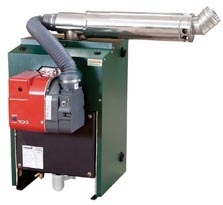 This is an outdoor condensing regular oil boiler 12-20kW manufactured by Firebird..This condensing oil boiler is ideal for installation in a dedicated boiler house, garage or outbuilding. It has an ErP A efficiency rating. The boiler is built using premium grade steel and is compact in size.